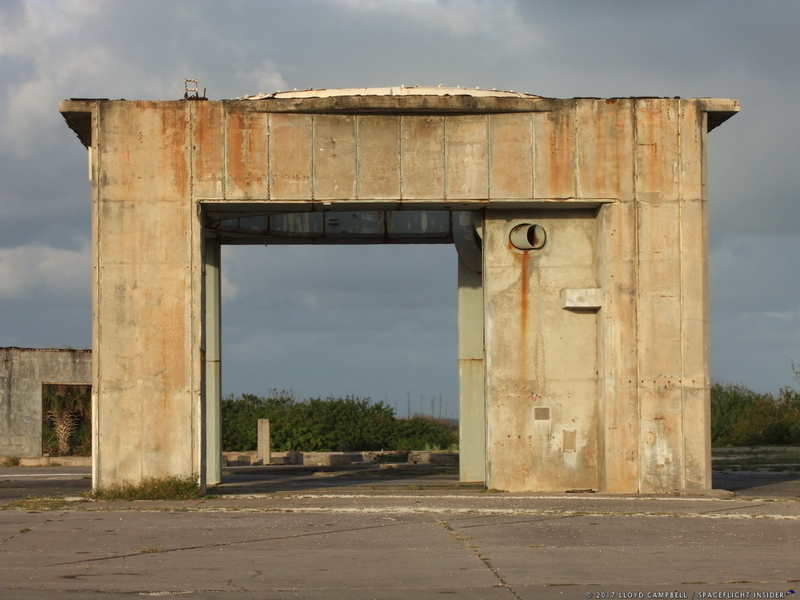 CAPE CANAVERAL, Fla. — In November of 1966, NASA would bring the highly successful Gemini Program to a close when commander James Lovell and pilot Buzz Aldrin splashed down in the Pacific Ocean. The tenth flight of the Gemini Program closed out the program on a high note and paved the way for NASA to move onto the Apollo Program which would land men on the surface of the Moon. The Apollo Program would first fly and test out the new spacecraft and equipment needed for a journey to the Moon in Earth orbit and eventually around the Moon. The design and unmanned testing for the program began well before the first manned Gemini flight ever flew. With less than three years left to fulfill President Kennedy’s directive to land a man on the Moon’s surface by the end of the decade, the pressure to keep moving the Apollo Program forward was increasing rapidly. The first manned mission, Apollo 1, was scheduled to be launched into Earth orbit on February 21, 1967. Apollo 1 would be commanded by Astronaut Gus Grissom, a veteran of both the Mercury and Gemini programs; this would be Grissom’s third spaceflight. Grissom’s crew would be made up of Gemini 4 pilot, Ed White, the first American to walk in space, as well as Roger Chaffee, a spaceflight rookie. The Command and Service Modules would launch atop a Saturn 1B. This would be the 141-foot (43-meter) tall vehicle’s fourth launch with three successful unmanned launches already completed. The mission of Apollo 1 was a relatively straightforward one, to give the Command and Service Modules (CSM) a thorough testing in Earth orbit. While there were many systems and procedures to be tested, ultimately this mission came down to proving the new spacecraft performed as planned. The Apollo Program had such an aggressive schedule that the new spacecraft was being built before the Gemini Program had even begun. Changes to design specifications and spacecraft capabilities were still ongoing even while the spacecraft was already being built. A significant change occurred when the lunar landing missions were adapted from Direct Ascent to Lunar Orbit Rendezvous (LOR), which necessitated reworking the spacecraft again. 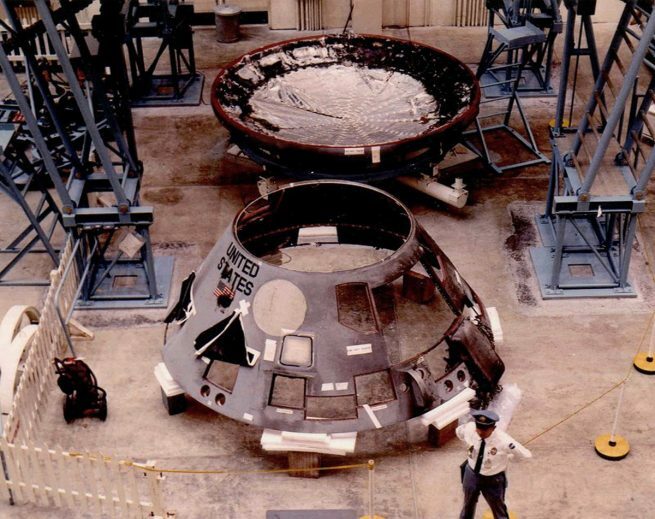 With all these developments occurring, in the end, NASA ended up with two versions of the Command Module, the Block I and the Block II spacecraft. In order to continue testing while the Block II spacecraft were still being built, NASA decided to use the Block I Spacecraft for the early Earth orbit missions. Unfortunately, launching the Block I spacecraft to find its deficiencies was proving to be unnecessary as it had numerous problems just sitting on the pad. At one point, the Apollo 1 crew was so unhappy with the spacecraft that they prepared a photograph of themselves praying over a scale model of an Apollo Command Module. NASA continued moving toward Apollo 1’s scheduled launch date, testing and fixing the spacecraft on the ground and, eventually, even on the pad would continue. With less than a month before Apollo 1’s scheduled launch, the all-important “Plugs Out” test was scheduled for January 27, 1967. For the plugs-out test, all the umbilical cables to the spacecraft are removed so that testing of the spacecraft fully under its own power and systems could be performed. The plugs-out test, while more complex, was similar to the testing done on the Gemini spacecraft and was considered routine and not hazardous due to the booster and spacecraft not being fueled. Also, since the fuel cells were not active, the Command Module would be running on its batteries alone. 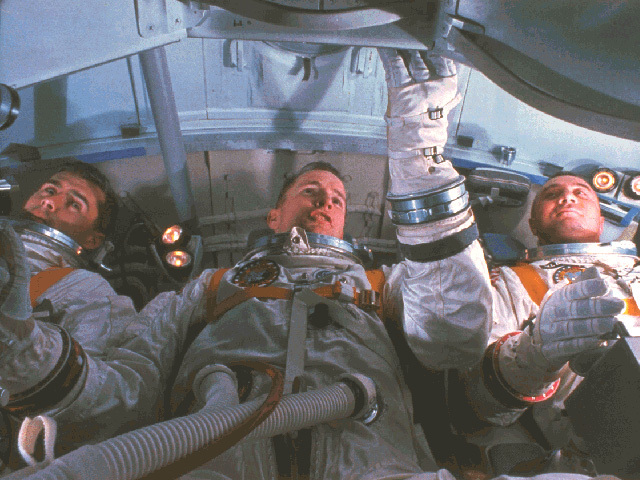 Grissom, White, and Chaffee donned their pressure suits and entered the spacecraft at 1:00 p.m. EST (18:00 GMT) and were hooked up to the capsules communications and oxygen systems. Almost immediately, Grissom relayed that there was a “sour buttermilk” smell coming from the oxygen system. After samples taken revealed nothing that could be the cause of the odor, the test continued at 2:42 p.m. EST (19:42 GMT). The Hatch was put on the capsule and secured, and the test continued. The capsule’s atmosphere was replaced with pure oxygen, standard procedure for the plugs-out test, at a cabin pressure of 16.7 psi (115 kPa) – 2 psi (14 kPa) higher than atmospheric pressure – to simulate the pressure required at launch. The simulated countdown proceeded on as the astronauts followed their checklists and noted any issues. Numerous problems with communications were observed by the crew, which were presumed to be due to an open microphone somewhere that could not be located. This caused a few delays during the simulated countdown. By 6:20 p.m. EST (23:20 GMT), the count had progressed down to the point where the plugs were pulled to simulate the vehicle’s switch to internal power and successfully completed. However, the count was held again due to the ongoing communications problem. That transmission, which lasted 5.0 seconds, ended with a cry of pain. The fire was being fueled by the pure oxygen environment inside the spacecraft and had increased the pressure inside the spacecraft well above the test’s 16 psi (110.3 kPa). Ed White, in the middle couch, would have been trying to open the hatch, but the Block I hatch design had the capsule hatch opening inward and with that much pressure it would have been impossible to open. 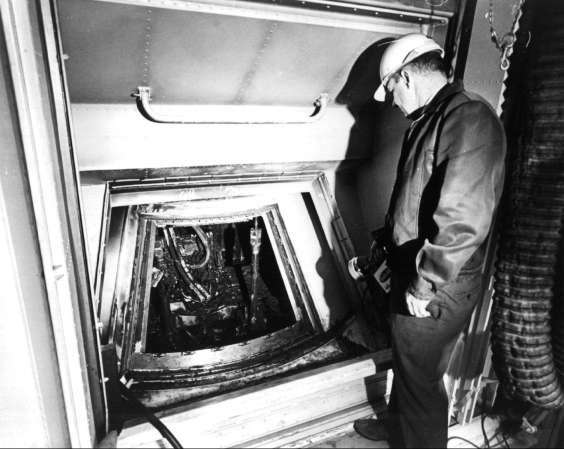 Also, the process to open the complicated hatch mechanism took 90 seconds under ideal conditions and, in practice, the crew took more than 90 seconds on every attempt to open the hatch. At 6:31:19 EST, just 15 seconds after the first call from the crew, the command module ruptured. Voice communications ceased just two seconds later. Disregarding their own safety, the pad crew continued to fight to open the hatches while extinguishing fires that had been started outside the spacecraft after the rupture of the pressure vessel. While the vehicle was not fueled, the Launch Escape System solid rocket motor that would pull the capsule away from the rocket in the event of an emergency during launch was fully loaded and could have ignited and exploded. All communications from the crew ceased just 17 seconds after the first indication of trouble from the crew. 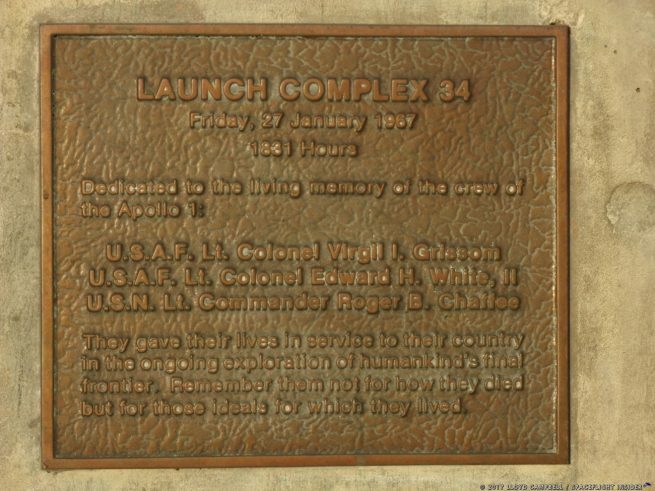 Almost 5 minutes after that first call for help, the hatch finally was opened by the pad personnel; however, the crew had all perished long before the hatch was opened. While the crew had second and third-degree burns, it’s estimated that they succumbed to a combination of smoke, carbon dioxide, and toxic fumes from materials that were burning within the first 30 seconds of the fire. From where they were found inside of the spacecraft, all the men were doing their assigned tasks in the event of an emergency: Chaffee on the Communications System, White was trying to get the hatch open, and Grissom was found on the floor of the capsule where it’s assumed he was attempting to extinguish the fire. Man’s journey to the Moon came to an abrupt stop on that January day in 1967. Many doubted if we could indeed make the journey and if it were worth the cost of the Astronauts’ lives. While this was the first loss of life in an actual space environment, the program had already lost Ted Freeman, Charlie Bassett, and Elliott See in plane crashes. The investigation into the fire by NASA took over 2 months to complete. Due to the extensive damage inside of the spacecraft near the ignition source area, the board was unable to identify the exact source of the fire; however, they determined that the fire most likely started via a short circuit in a bundle of wires that ran in front of Grissom’s couch. Nevertheless, that alone was not what caused the astronauts their lives. A large amount of flammable material in the spacecraft cabin, including velcro, nylon netting, and the astronauts’ spacesuits themselves, coupled with the pure oxygen environment at higher than normal atmospheric pressure, allowed the fire to spread and increase in intensity at a rapid pace. In all, there was almost 34 sq. feet (3.16 m2) of Velcro in the cabin. Velcro, while never a fire retardant material, turns out to be highly flammable in a pure oxygen environment. In fact, at 16.7 psi (115 kPa), those materials burned twice as fast as they did at 5 psi (34.5 kPa), but that fact was not determined until after the fire. Other deficiencies were found with the inward opening hatch design, the lack of adequate emergency escape procedures for both the crew and pad personnel, as well as the 16.7 psi (115 kPa) pure oxygen environment. In fact, the crew and then Apollo Spacecraft Program Office manager, Joe Shea, expressed concerns about the abundant use of velcro and nylon in the spacecraft shortly before it was shipped from the manufacturer, North American. Shea had agreed to “clean up” the spacecraft; however, it was never done. Later, Shea stated that it would have been cleaned up prior to launch, but it was not felt that it needed to be done for a routine test. NASA had become complacent about many things and it ended up costing the crew their lives. Sweeping changes to the program would have to be made if Apollo would fly again. Congressional hearings following the Apollo 1 fire had added further delays to the program. Deficiencies in quality, maintaining of schedules, maintaining of construction and modification records, lack of proper emergency procedures, and failures of the program to properly address the hazards that caused the fire were cited. Several reports, including the “Baron Report” and the “Phillips Report”, were noted as showing severe deficiencies in the program and the need for improvements in many areas. Testimony by agency officials sometimes contradicted those reports. When, in fact, the reports, other accidents, and other tests previously conducted showed that NASA was, while certainly unintentionally, ignoring what turned out to be a lethal situation inside of the spacecraft. Eventually, the hearings came to an end and the Apollo Program would once again move forward, but a lot of work needed to be done. The first change was to abandon the Block I spacecraft for any remaining manned flights. The spacecraft with all its inadequacies was just not safe. NASA decided it would be a better to wait and get the Block II spacecraft on line and use it for all future manned flights. The remaining Block 1 Command Modules were used for testing purposes and test flights only. The Block II spacecraft was already being equipped with a new outward opening hatch allowed quicker egress from the spacecraft. The hatch could be manually opened by one of the crew members in about 5 seconds. In an emergency, compressed nitrogen gas cartridges were used to open the hatch almost instantaneously. To address the flammable materials inside of the spacecraft, a new Velcro material was designed that was fire resistant. The nylon sections of the astronauts’ spacesuits were replaced with a new fiberglass based material called beta cloth which was non-flammable and resistant to melting. Wiring and plumbing inside of the spacecraft were covered with a protective insulation to keep them from becoming worn or frayed. Other self-extinguishing materials were developed that would replace flammable ones inside of the spacecraft. NASA also addressed the pure oxygen environment, replacing the launch environment with a 60 percent oxygen / 40 percent nitrogen mixture. Even at 14.7 psi (101.4 kPa), this mixture would not spread a fire as rapidly as the pure oxygen one did. The astronauts would be in their spacesuits breathing pure oxygen at 5 psi (34.5 kPa) as they had been before. The breathing of pure oxygen by the crew during ascent was crucial to them not getting decompression sickness, also called the “bends”. The rapid drop in cabin pressure could cause decompression sickness and so the astronauts would breathe pure oxygen a few hours prior to liftoff to purge nitrogen from their bodies. The spacecraft’s mixed atmosphere would be slowly vented into space and replaced with a 5 psi pure oxygen environment for its voyage in space. It took 21 months before Apollo would fly again. On October 11, 1968, Wally Schirra, Walt Cunningham, and Don Eisele would launch from Launch Complex 34 on the Apollo 7 mission and complete the testing of the Command and Service Modules in a space environment. Don Eisele was originally slated to be on the Apollo 1 crew with Grissom and White, but he ended up requiring surgery on his shoulder and was replaced with Roger Chaffee. The Apollo Program had been saved and mankind’s journey to land on the Moon was once again moving forward. With just 14 months until the end of the decade, there was a lot of work to do, but NASA and its contractors were back on track to fulfill Kennedy’s goal of landing a man on the Moon before the decade was out. 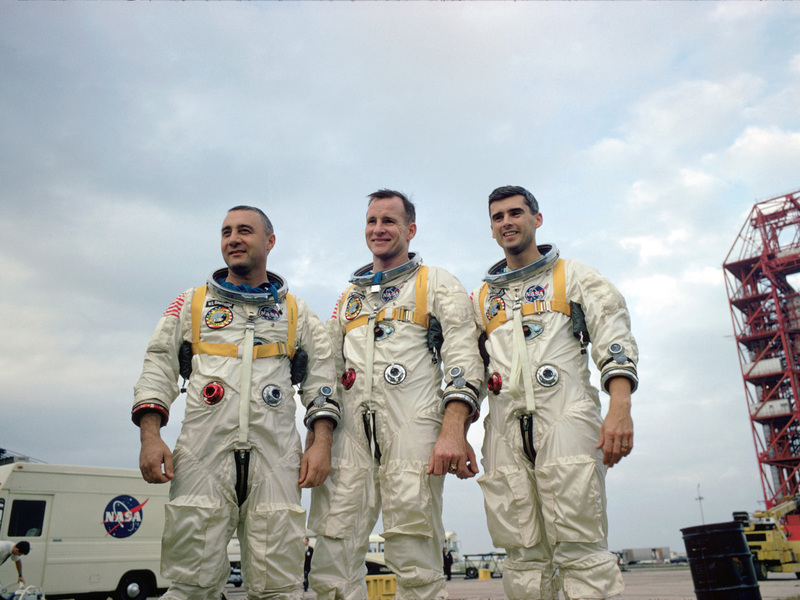 In tribute to the crew of Apollo 1, NASA has opened a new exhibit honoring the lives, accomplishments, and heroism of the three astronauts who perished 50 years ago in that fateful fire at the launch pad while training for the flight. 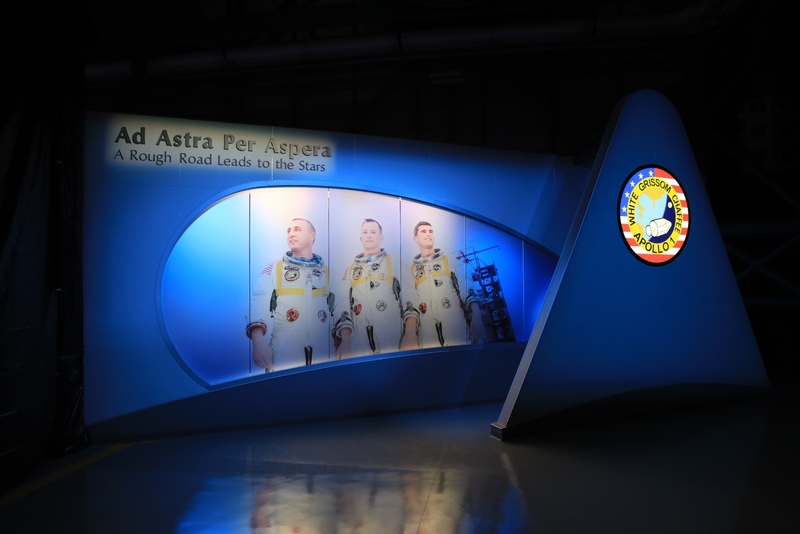 The permanent exhibition, called “Ad Astra Per Aspera – A Rough Road Leads to the Stars”, showcases clothing, tools, and models that characterize the men as their parents, wives, and children saw them, as well as how the nation viewed them. Also on display for the first time at the exhibition is the three-section hatch from the Apollo 1 capsule that had caught fire. Features at the new tribute tell the full story of the astronauts’ lives, the events leading up to the fire, and the strenuous efforts by the NASA team to recover from adversity. The primary purpose of the exhibition is to introduce the astronauts to the younger generation who have never met them nor know much about them or the early space program. I was in 6th grade when this tragedy occurred. Being so young at the time I know i really didn’t recognize fully the bravery necessary to be an astronaut, attempting to fly in what was really a test vehicle. It is a tribute to the people at that time that they went forward and completed the goals that had been set.